By implementing these new features we will learn amongst other how to use Ajax with Juzu, interact with Portlet Container or add an EDIT mode to our Portlet. Let’s start by improving a little bit the application models. 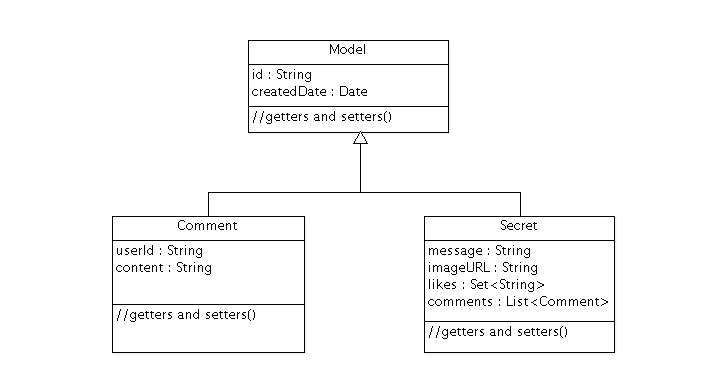 Make Secret extends Model class to inherits the parent attributes. That’s enough ! Our model is ready for comment and like feature. Now we need to improve the Secret service by providing an API to add comments and like secrets. Our Secret Service need two more methods to manage the new functionalities. One for adding comment to secret (addComment method) and an other one to like a secret (addLike method). Similarly to step-2, data is still saved in memory for now. Done for service layer ! This two methods are pretty simple and self-explained so we don’t have to spend time on it. It’s time to go back to Juzu and improve the presentation layer. 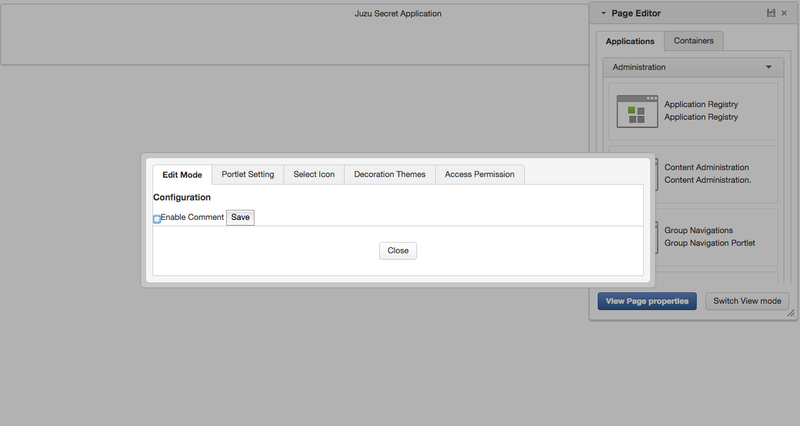 The comment and like action will be manage using Ajax via the @Ajax Juzu annotation from the Juzu Ajax plugin. The Ajax plugin like the Binding plugin is already included in Juzu-core, so no need to add new dependencies in our pom. It’s important to know that the Juzu-Ajax plugin depends on jQuery. So it’s mandatory to declare jQuery ad we do in the previous step if we want to use this plugin. @Ajax annotation comes from Juzu-Ajax plugin, it provide us convenient ajax calling method: jzLoad, jzAjax. We’ll use this later in secret.js. @Resource is a new type of Controller. Resource controllers are pretty much like a view controller except that they must produce the entire response sent to the client and that is perfect for implementing ajax request. @Mapped allow to map request parameter to Bean types. Juzu do automatically the conversion between the primary types and the request parameters but for a Bean, we need to declare it with @Mapped. Consequently the parameters of the add secret form will be automatically mapped to the attribute of the @Mapped Bean. You just need to declare it in the method sign as we do above for SecurityContext and Juzu will inject them automatically at runtime. You notice that we response a Json data to our client by declaring the MimeType to text/json. Now we need to handled this response on the client side. We need to add two new buttons to like a secret and comment a secret in the secretWall.gtmpl. Then for Comment feature we need also to display a popover to show the list of current comments and add a new comment. […] means sections already added in step 3. Now we have 2 buttons for comment and like features and a popover to display the list of comments. Now that we finish the UI part, we need to add some js handlers to manage this two features using Ajax. jzAjax and jzLoad functions are jQuery plugin provided by the Juzu Ajax plugin. They replace the standard Ajax and Load jQuery function. They accept the same arguments but the URL is replace by the controller method. All we need is provide the controller method like JuZcretApplication.addLike() and Juzu take care to find the expected URL, and perform Ajax request (using jQuery). There is one major difference in this second handler is that we handle error response. For which purpose ? To not allow user to submit empty comment. It’s why our Juzu controller should be aware of invalid data that user submitted. Lets move to data validation and error handling provided by Juzu. Thanks to @Pattern and @NotNull annotation, the validation framework will validate the parameter and throw validation error if needed. Now if a user try to enter an invalid comment, the validation framework will throw an error. Our job is not totally finish… We need also to cache properly this error. In our case we will use the request lifecycle that allow us to handle the error in the controller. What we need is to analyze the Response and check if the type is ValidationError. If it is, we simply get the error message and update the response to send it properly to the client. If you continue this step just after finishing the step 3, you just have to compile your project, paste the new created war in eXo Platform and start the server. Then access to your JuZcret page and take a look at the result. If not, configure your project to use JRebel, compile it and deploy it in eXo Platform as explained in step-1. What is missing is an administration part to manage our application. An administrator must have the availability to configure the portlet. For instance, he may want to disable the comment feature. To doing this, what is better that adding a portlet edit mode ? Our JuZcret application configuration will rely on the portlet preference mechanism. Juzu framework provide a juzu-portlet plugin which help to bind portlet preference to our IOC container and allow use to inject and use PortletPreferences in our controller to store the configuration data of our portlet. After saving the portlet preference, notice that we redirect the portlet to the View mode by responding with a Juzu property, the JuzuPortlet.PORTLET_MODE property type with the value PortletMode.VIEW. From security perspective, hiding the social toolbar on the bottom is not enough to prevent user from commenting, but for the sake of simplicity, we decide that it’s acceptable for this tutorial. So when you disabled comment you cannot like or comment secret. Social features are deactivated. To know the current Portlet mode, we use the RequestContext object automatically injected by Juzu that allow us to check the property JuzuPortlet.PORTLET_MODE. Stop eXo Platform, copy/paste the new created war in webapp folder and restart eXo Platform. Go to the JuZcret page, click on Edit → Page → Edit Layout. Then mouse over the "Juzu Secret Application" and click on the "Edit Portlet" Icon. We are at the end of the step 4 with a nice social application. But our JuZcret application miss an important thing from production. We don’t persist data, all is saved in memory… For fix it, go ahead to the step 5!